You don't have to look far to find plenty of art ideas for kids. Just do a quick pinterest or google search and you'll have dozens of activity ideas and craft kit options. But, usually these kinds of projects leave you feeling like there's something missing. There's nothing wrong with doing crafts just because they are fun. But if you're going to make the effort to get creative with your kids, why not make the most of it? In the same time you would spend to do a "how to make your handprint into an owl" project, you could introduce your kids to a great piece of art, and the fascinating life of the artist who made it! Don't be overwhelmed by the endless options out there. Be inspired by the endless options! I like to start by thinking about what else we're currently studying, or what my kids are interested in. Next, choose one piece of art to look at. It's not a cop out, I promise. If you study one piece of art, your kids will remember it. If you introduce them to every work Van Gogh ever did in an afternoon, they'll probably remember a few things, but the impact is diluted. Finally, invited your kids to make some art inspired by what you just looked at and talked about. There's no right or wrong. Keep it open ended and see what your kids come up with! This kind of meaningful art experience results in some magical benefits for your kids! They respect their community, and feel a responsibility to help take care of it. They see loveliness in the little details of life that often get overlooked. They pay attention to detail, and feel gratitude for all the goodness that surrounds them. And that understanding of history helps them feel more connected to their place in the present, and better able to envision where they want to go in the future. Your kids will learn how to take a moment to look carefully at something (in this case, art), and then they will formulate an idea or an opinion. They'll gain confidence as they discover ways to turn those ideas into words and have a meaningful conversation with you! You don't have to like every style of art. But every style of art has someone who thinks that style is the best! Learning from a young age that different isn't necessarily better is a lifelong perspective that will allow them to be adaptable, open minded and extremely resilient later in life when someone doesn't like something that they do. My kids LOVE the art of Jackson Pollock, and when they learned that most of the art world hated his art when he first made it, they were shocked. Now when someone doesn't love their (dance, story, game, idea), they don't take it so personally. They know there will always be some people who love what you do and some people who just don't. Why did s/he paint that? Why did s/he paint it that way? What political, societal, and scientific changes caused the progression of art to develop as it did? What does the _____ symbolize in this painting? What does this mean? Remember when your kids were 3 and 4, and they asked questions NON-STOP? That level of intense curiosity is a primal instinct that we actually need for survival. We feel a strong urge to understand the world around us from a very young age, and that instinct may grow quieter in some children as they get older, but if you fan the spark of curiosity in them, they will continue to wonder, to ponder, and to think. They will be able to assess situations and form opinions based on fact. They will also be in touch with their intuition, and have a better understanding of why certain things make them feel a certain way. If you need a little reminder to stick up on the wall, I've got just the thing! Join the email list and you'll get access to the resource library – which is full of fun stuff – and where I've just added a Picasso quote pdf for you to download and print. It's a fun reminder to make art part of your every day plan– even if it's only for 5 minutes. 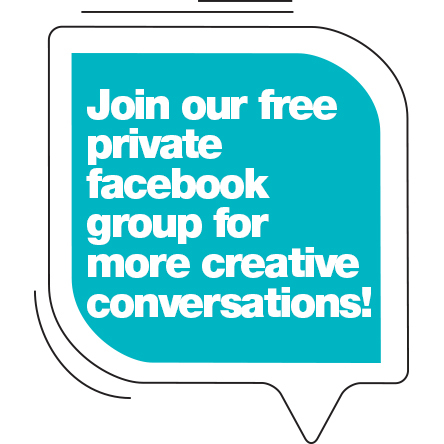 Make sure to connect on social media and join us in our free and fun Facebook group where we chat about art!